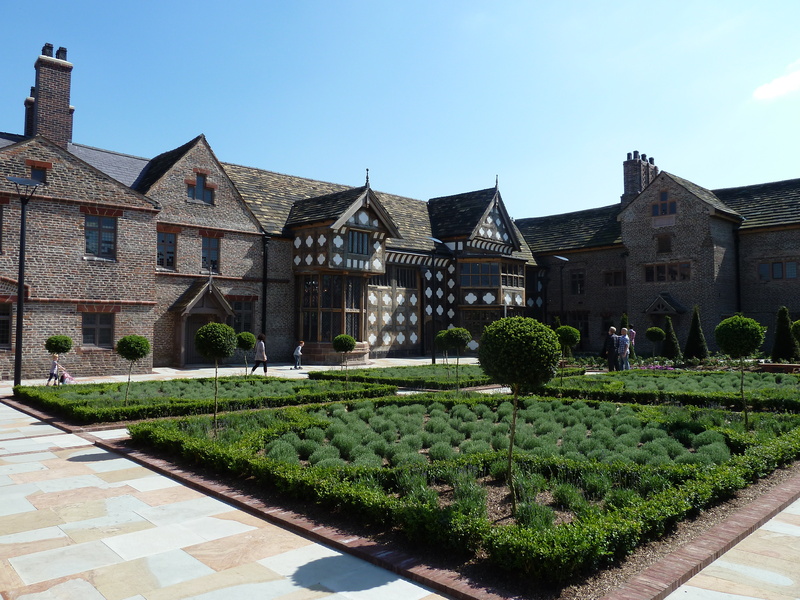 Today I went to visit Ordsall Hall in Salford on the outskirts of Manchester. £6.5 has recently been spent restoring the building and grounds and compared to my last visit, before the work was done, it is impressive and there is so much more to see from the well deep below the kitchen to the roof timbers in the attic. And don’t be put off by the car park charge, entry to the hall is free. Much has changed since the first house was built here in 1251 when it was a country estate surrounded by farm buildings and 80 acres of arable land growing wheat and corn. The hall is now surrounded by the suburbs of Manchester and you can see modern buildings, including the sky scraping Beetham Tower, not far away. The buildings to the left show how near the hall is to modern housing. Ordsall is first mentioned in 1177 and there was probably a house here by 1251 when William de Ferrers, earl of Derby, exchanged the manor with David de Hulton for land in Pendleton. 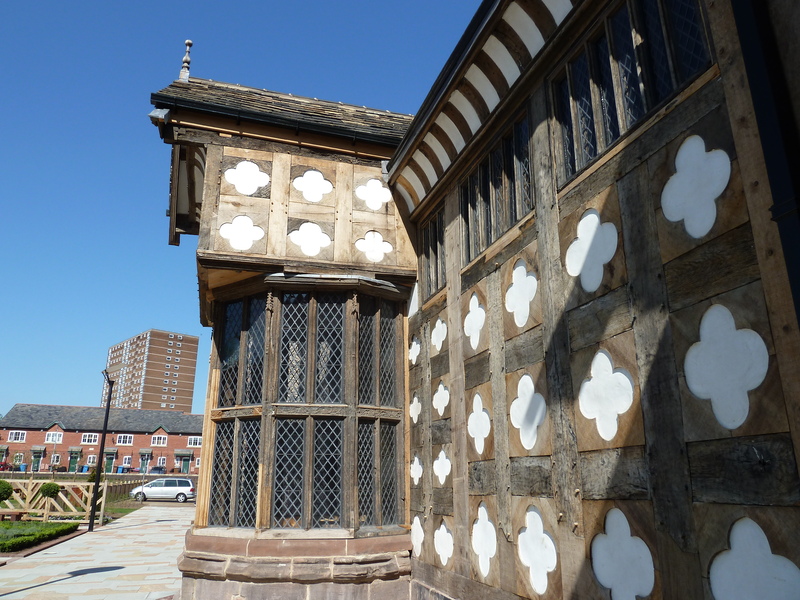 Ordsall Hall is best know as the home of the Radclyffe family. The manor was bequeathed to Sir John Radclyffe in 1335 by the childless Richard de Hulton. 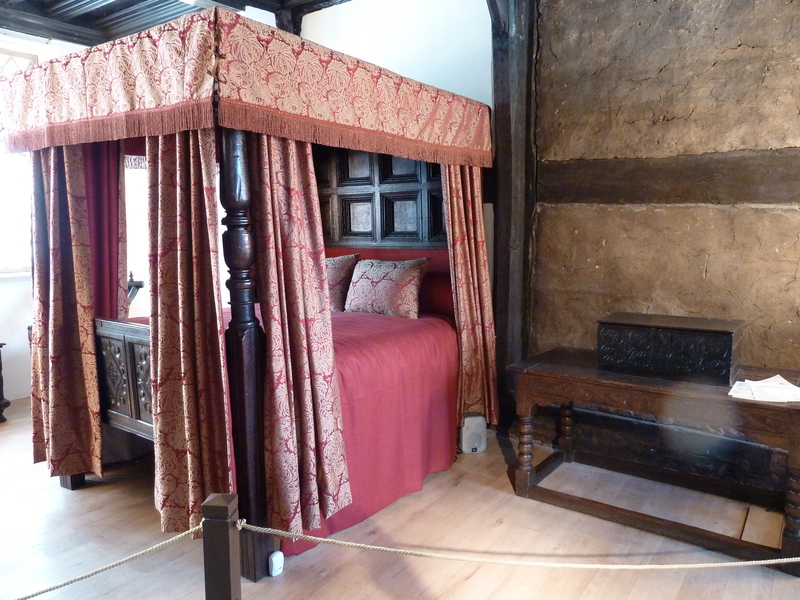 By 1380 Sir John had created a building with a hall, five chambers, a kitchen and a chapel. The estate included three farms, two shippons, a granary, a dovecote and a windmill as well as the arable land and six acres of meadow. Sir John fought in France with Edward III and was granted the right to use the motto ‘Caen, Crecy, Calais’. The family has a long and fascinating history and took part in the Hundred Years War, the Wars of the Roses and the English Civil War. 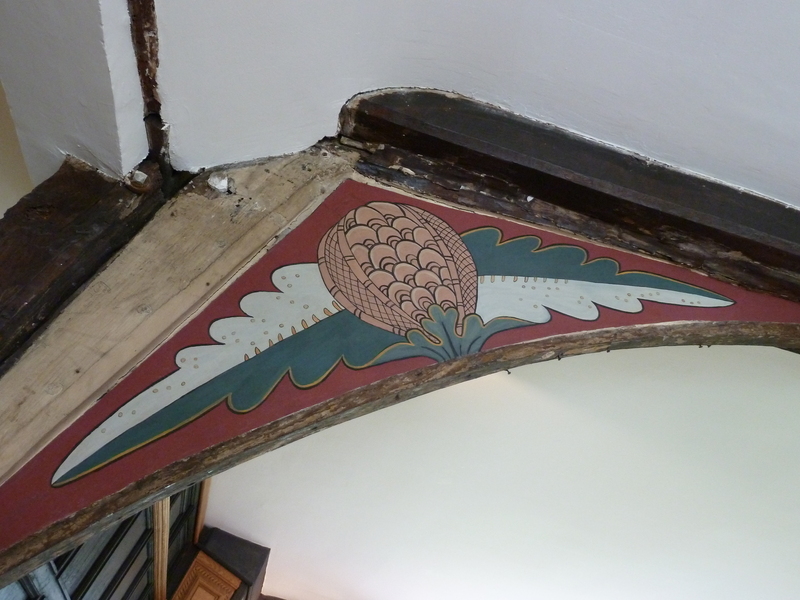 One of the stories told at the hall is that of the tragic Lady Margaret Radclyffe who lived from 1575 to 1599. After her twin brother Alexander was killed fighting in Ireland, she died, heartbroken, despite the personal care of Elizabeth I, whose lady she was. 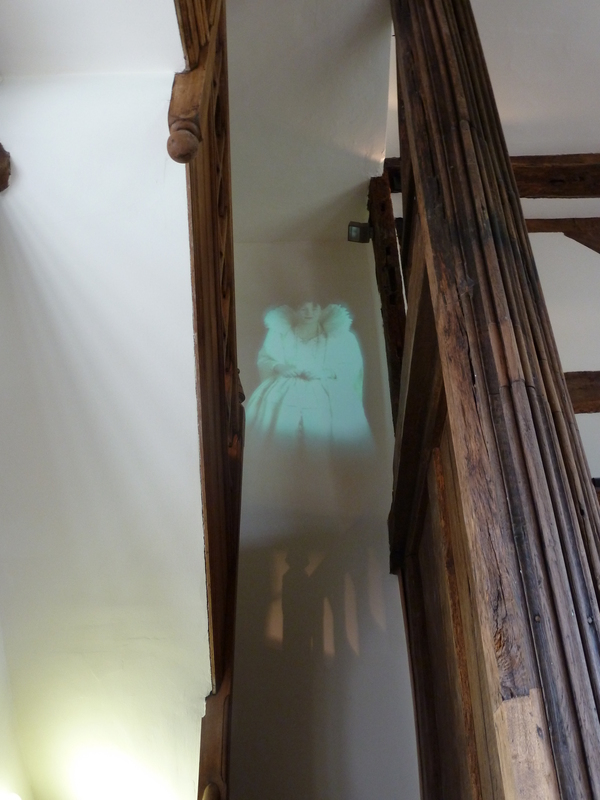 The hall has a wealth of ghost stories and sightings of the White Lady could be Lady Margaret as she waits for her brother to come home. The ghost here is created by modern technology, but the hall is an atmospheric place, especially the Star Chamber, which is one of the surviving rooms from the original hall. I’m normally quite skeptical about ghosts, but on both visits to this room I’ve stood in a particular spot near the fireplace and had a very strange feeling of apprehension and grief. I also captured an extraordinary number of ‘orbs’ on my photos. Perhaps it was all those spotlights. Or maybe something else? 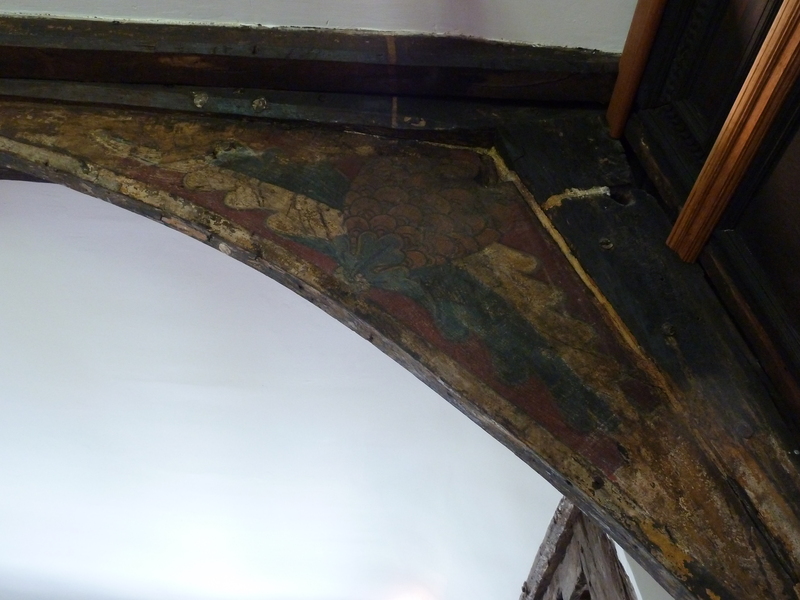 Upstairs in the Great Chamber, set out to represent the bedchamber of Alice Radclyffe in 1510, you can see paintings on the roof beams that are thought to date from around 1360. The image below is a modern recreation of the original. It depicts a pomegranate – a symbol of unity and fertility which often appeared in private bed chambers. Down in the kitchen the well has been uncovered. The last time I was there I was given a pair of dousing rods and although I didn’t believe anything would happen they almost flew out of my hands – and now I can see that there really is a well at that exact spot! 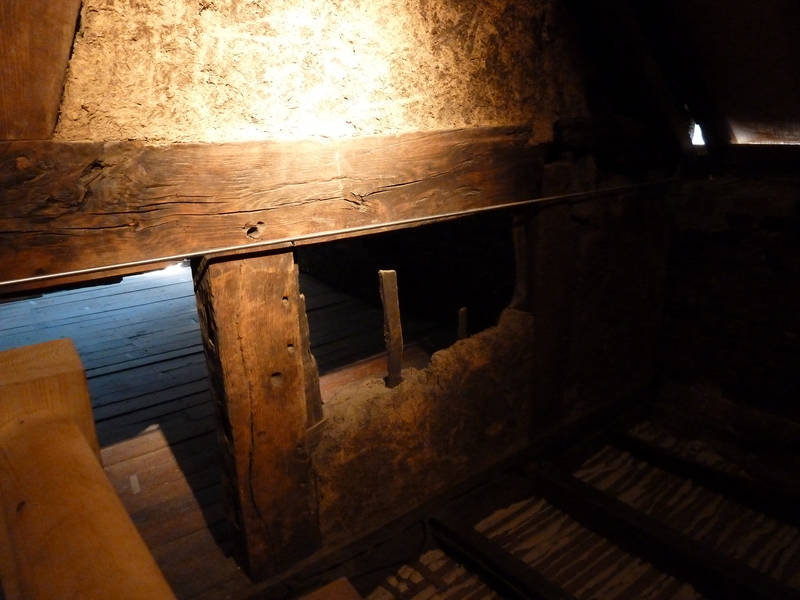 Another area now open to the public is the roofspace where you can clearly see the wattle and daub construction of the earliest parts of the hall. It was also refreshing to see the outer woodwork cleaned of its black paint. 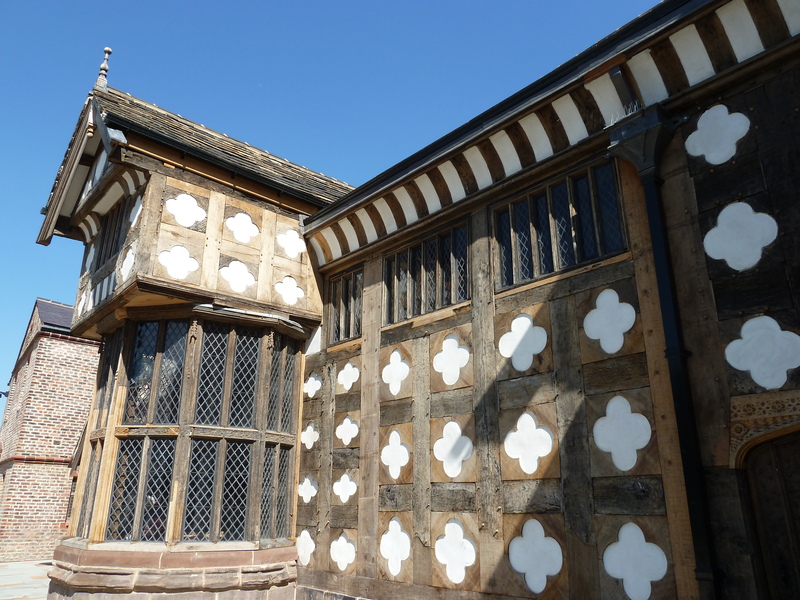 Tudor buildings never were black and white and the current colours are not only authentic but much more pleasing to the eye. 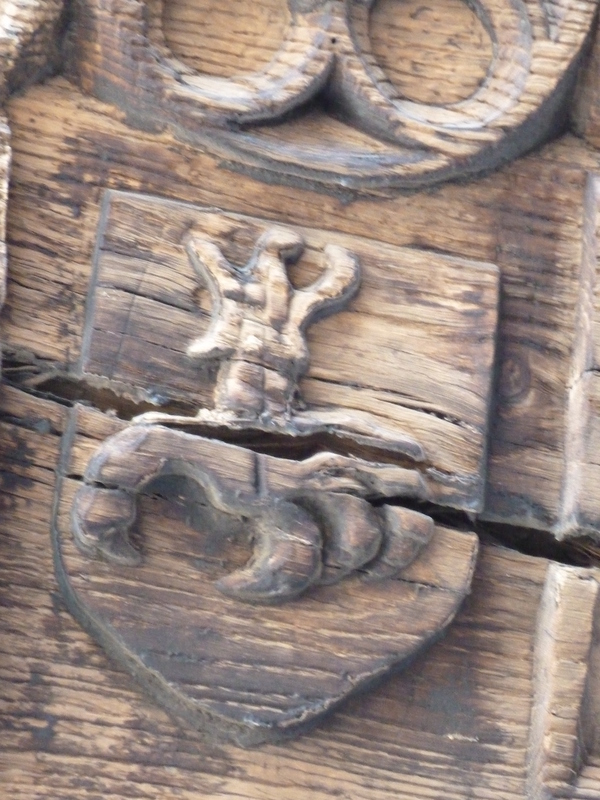 And if you do visit, look up before you go in the main door and you’ll see an eagle’s claw, the emblem of the Stanley family. In 1430, Agnes Harrington who was a cousin of Thomas, Lord Stanley, married Alexander Radclyffe, thus linking the two families. The Stanleys were hugely influential in west Lancashire and were responsible for the defeat of Richard III at Bosworth – but that’s a story for another day. Re the Stanley family connection. I’ve just come across a Salford council PDF about the restoration of stained glass windows from the hall, one of which is the coat of arms of Thomas Stanley, second Earl of Derby. Do you know if it is still there? Thanks. I can’t be certain. It’s a while since I was there. Your best bet is to contact the hall. I’m sure they will be able to help. Next Could this be Alice de Lacy?